The angled head on these Wiha Tri-cut Pliers allows you to work in hard-to-reach places such as installation sockets. Cable work can be tough on an electrician’s tool bag, with three pairs of pliers for the various stages of the process. As a result, swapping between cutting, stripping and skinning can really slow a job down. Wiha Tri-cut Pliers offer a handy remedy to this problem, as a three-tools-in-one solution. The VDE diagonal cutters can be used for cutting soft and hard wires, as well as cables, making them a versatile piece of kit. 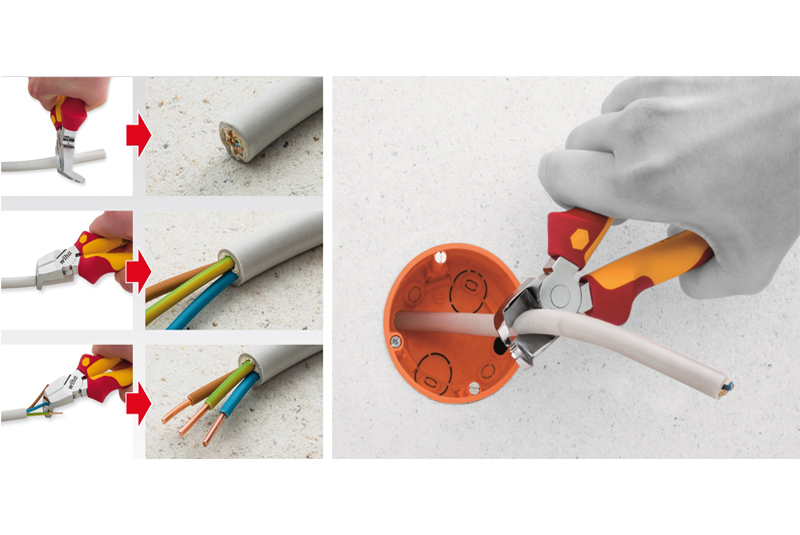 Perfect for tasks such as flush stripping of round and damp-proof cable and the stripping of conductors, the cutters have an angled head, for easy work in hard-to-reach places, such as installation sockets and distribution boxes. The pliers are VDE insulated, making them suitable for all types of work on or around electrical components up to 1,000V AC, while the low-wear, inlaid joint with heavy-duty riveting makes them robust and durable. The pliers are ergonomically designed too, with a cushioned grip to reduce hand strain. Previous : V-TAC Asks if You’re Ready for the Halogen Ban?